Whether you’re an experienced forklift driver or a relative newbie, there are a few on-the-job hazards that demand constant attention. From blind spots to weather considerations to tip-overs, you have to be aware of a few dangers. If you drive forklifts in enclosed areas or indoors, one potential hazard stands out from all the rest: carbon monoxide poisoning. OSHA regulations and training requirements rightly treat carbon monoxide as a serious danger to a forklift driver’s well-being. Their special online training spotlight features carbon monoxide, with plenty of warnings that explain how to avoid this noxious gas. What is carbon monoxide, and how can it impact forklift operation? The OSHA training experts at Forklift Certification have put together this article to help you better understand the risks associated with carbon monoxide. We’ll explain how to avoid carbon monoxide on the job, along with specific tips you can use in your daily forklift duties. But first, let’s take a crash course in what exactly carbon monoxide is. Carbon monoxide (commonly referred to as CO, its scientific compound) is colorless. It’s odorless. But definitely not harmless. According to the U.S. Environmental Protection Agency, carbon monoxide is the by-product of fire – whenever something is burned, CO fumes result. Air with too much CO doesn’t have enough oxygen. If a large amount of carbon monoxide is inhaled, your body’s oxygen supply is reduced. As a result, the brain, lungs and other organs cannot receive the required amount of oxygen to properly function. Just some of carbon monoxide’s effects include dizziness, severe headaches, nausea, confusion, blackouts & unconsciousness, and even death. For forklift operators and other workers that deal with powered industrial trucks, the product being burned is fuel and oil in an internal combustion engine. Most forklifts use this type of engine, although electric trucks are becoming more common nowadays. 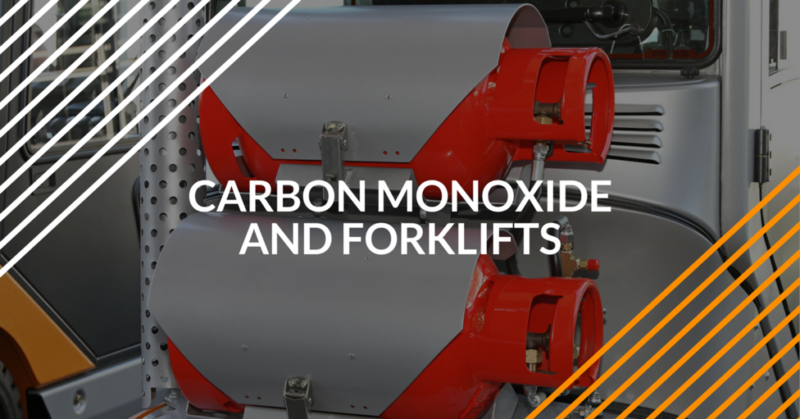 Thus, carbon monoxide and forklifts aren’t going away anytime soon – and that can be a potentially fatal combination. 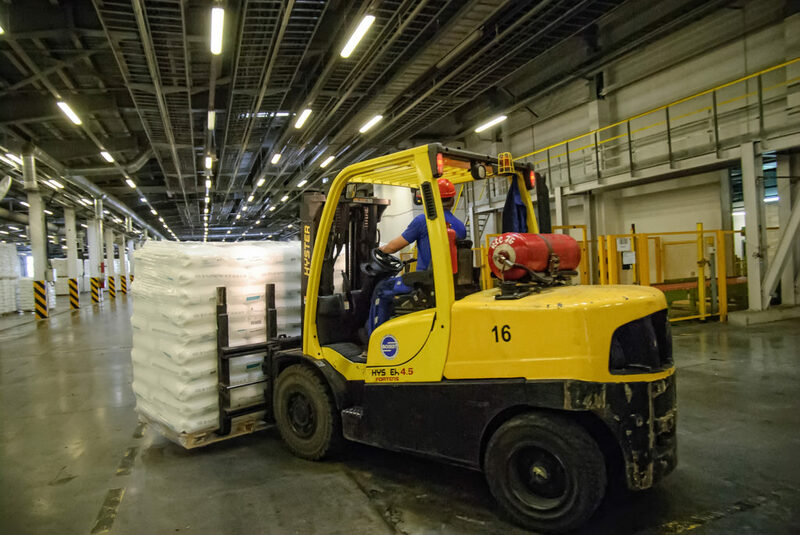 OSHA considers carbon monoxide and forklifts a hazard to keep an eye on – even though the gas can’t be seen by the human eye. Because you can’t smell or see CO, you have to pay attention to your surroundings when running a forklift, especially in indoor areas (warehouses & distribution centers, for example) or enclosed spaces. What qualifies as an enclosed space? OSHA reviews some of these areas in their Enclosed and Hazardous Areas online e-learning resource. To help reduce the chances that forklift operators will breathe in CO, there are certain designated areas (11 in total) which OSHA requires employers to clearly mark. To prevent carbon monoxide poisoning, always follow your company’s designated area guidelines. If you aren’t sure, ask your safety supervisor. Another way to reduce your chances of breathing in carbon monoxide is to pay attention to indoor air quality. OSHA standard 29 CFR 1910.178(p)(1) requires specific maintenance practices for forklifts, and to avoid using lifts under service. In keeping with air quality best practices, you should also shut off your forklift’s engine in confined spaces, and stay up to date with your area’s ventilation system maintenance. Finally, you should review the signs and symptoms of CO poisoning with your safety supervisor. Knowing the effects of excessive carbon monoxide around forklifts can help prevent injuries and fatalities. There are some other ship-specific hazards to be aware of, outlined in OSHA standard 29 CFR 1915.12. Wherever there are gas-powered forklifts, there is carbon monoxide. In 2017, there were well over 2,000 OSHA violations involving powered industrial trucks. Many of these involved carbon monoxide while operating forklifts indoors or in confined spaces. Violations with forklifts commonly rank inside the top 10 yearly OSHA workplace incidents. But it doesn’t have to be this way. With a thorough understanding of OSHA forklift operation, you and your co-workers are optimally prepared to avoid carbon monoxide accidents and incidents. The best way to ensure you have the knowledge and skills is with training – and no other OSHA training course can match Forklift Certification. Our online classes are the most affordable, efficient way to receive the training you need to excel on the job. You’ll drastically reduce the chances of encountering an on-the-job incident involving carbon monoxide. With a flexible and convenient online format, you’ll have your OSHA-compliant credentials faster than you think – in many cases, our courses can be completed in less than an hour. In no time at all, you’ll have everything you need to become a certified forklift operator. With a standard training package, special Train a Trainer option and value-added Bundle Package, Forklift Certification provides all the training required to become a safer, better, more confident forklift driver. Thanks for reading the Forklift Certification blog! If you need to learn more about carbon monoxide or require training in order to start working today, we’re here to help. To learn more about our OSHA forklift training, please call us today at (888) 278-8896. We look forward to helping you avoid carbon monoxide incidents at work – and every other hazard that happens to come your way!